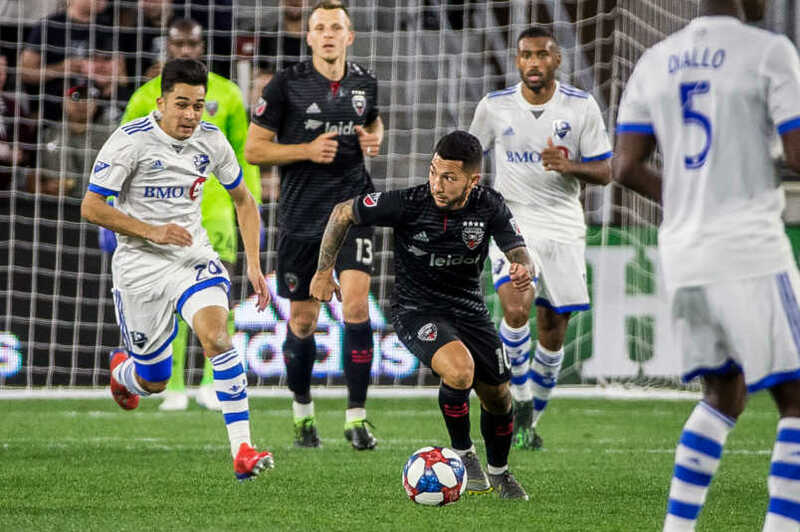 By Jason Davis – WASHINGTON, DC (Apr 10, 2019) US Soccer Players - After Saturday’s rout at the hands of LAFC, DC United star Wayne Rooney suggested that getting back on the field quickly would be good for his team. The idea was that playing a competitive game would help United put the embarrassment of the loss behind it and push the team to regain the form that had the Black & Red as an early leader in the Eastern Conference. Despite his feelings on the matter, Rooney knew that he would play no part in United’s bid to bounce back. Rooney’s straight red card for a dangerous tackle on Diego Rossi early in the second-half of Saturday’s loss ensured as much. United’s attempt to climb into a tie with Columbus for first place in the conference would have to happen without their primary offensive threat. That forced United coach Ben Olsen to make changes. A 0-0 result against a compact, defensive-minded Impact team proved those changes ineffective. In Rooney’s place Olsen turned not to MLS veteran forward Quincy Amarikwa, signed on the eve of the season, but Ulises Segura, a natural midfielder. The creative responsibilities were always going to Luciano Acosta without Rooney available. The Impact rarely risks sending too many bodies forward, the better to defend and look for counterattack opportunities. The Impact used physical play and tactical fouls to slow down the United midfield. A lack of sharpness from the hosts contributed to an inability to play through Montreal’s midfield, but the 15 fouls committed by the visitors speak to the plan. For Montreal, the absence of Ignacio Piatti limited their threat on the counter. Ahead of the first home game of the season on the weekend, Piatti was back in Montreal recovering from a knee injury. The Impact was also missing Maxi Urruti due to a red card suspension. Impact coach Remi Garde rotated in a host of players who had seen limited time this season in place of his missing stars. Of the eleven players on the field, six were Canadian. Though the personnel was different, the approach did not change. Montreal defended United largely in their defensive half, limiting the space available to Acosta. There was a decided lack of combination play from United. If Acosta or any of his teammates were able to play quick one-touch passes at all, none of those moments amounted to anything. There was an element dramatic irony to Acosta playing the lead role in Rooney’s absence on Tuesday. A report by Pablo Maurer of The Athletic placed a Manchester United scout in the building when United faced off against LAFC. That makes them just the latest in a growing list of foreign teams to express some interes. Acosta played far from his best game, taken off by Olsen in the 73rd minute. It was a moment that hearkened back to the pre-Rooney version of both Acosta and DC United. Against a team unwilling to stretch themselves in search of a goal, the degree of difficulty was higher than usual. The Impact played their game exactly as Garde would have drawn it up. His team barely threatened Bill Hamid in the United goal, but neither did DC find any real joy on the other end. Acosta’s frustration was obvious as move after move ended without so much as a shot on target for the home side. As the game pushed into the final 15 minutes, Acosta took it upon himself to try and make the breakthrough happen. It looked like the 2017 version of Acosta, not the breakout 2018 version that helped United return to the postseason. In the 80th minute, Acosta fired a wayward shot from the right corner of the 18-yard box. It was evidence of his desire to put a stamp on the game, even if shooting was not the most advisable decision. The night also put on stark display the thinness of United’s roster. Fullback Joseph Mora’s jaw surgery forced Chris McCann into the lineup at left back. When McCann pulled up with a muscle strain in the second-half, Olsen put on Lucas Rodriguez and moved Paul Arriola to into the back line. Pulling Arriola further away from goal was less than ideal as it took away one of the few direct threats United possessed. “Our outside back spot is unbelievable, how many outside backs we go through,” Olsen said. It's hard to fault Segura at forward. Olsen’s decision to leave Amerikwa on the bench until the 64th minute might speak to a lack of trust in the newcomer, or a belief the other qualities Segura offered were more important than having a natural forward on the field. United’s possession edge was smaller than it should have been considering the Montreal approach. At the half, it was the Impact who had the advantage in possession, content as they were to push the ball around the back. DC’s numbers improved with a better second half on the ball, but none of that possession turned into clear cut chances. If viewed as a test of United’s credentials as a contender for the top spot in the East, Tuesday night’s dour draw was a disappointment. The top teams need to win games at home against lesser competition, even when that competition chooses to play ultra-conservatively. Top teams use depth to their advantage, even when starters are missing or unavailable. If viewed as a test of Acosta’s ability to carry the team in Rooney’s absence, or as an additional audition for a possible move abroad, the game was also a disappointment. It’s an unfair ask for Acosta to do it all. Still, expectations are higher than ever before thanks to his performances in 2018 and the rise in estimation both in the US and abroad. No one should judge Acosta based on one performance surrounded by a weakened team. Neither will United be dropped from contender status because of the disappointing draw. It wasn’t good, but as is so often the case when the games come on top of one another and depth is tested, it could have been worse.